I started by working on the electronics side of things. I am using an Arduino to control the lights. 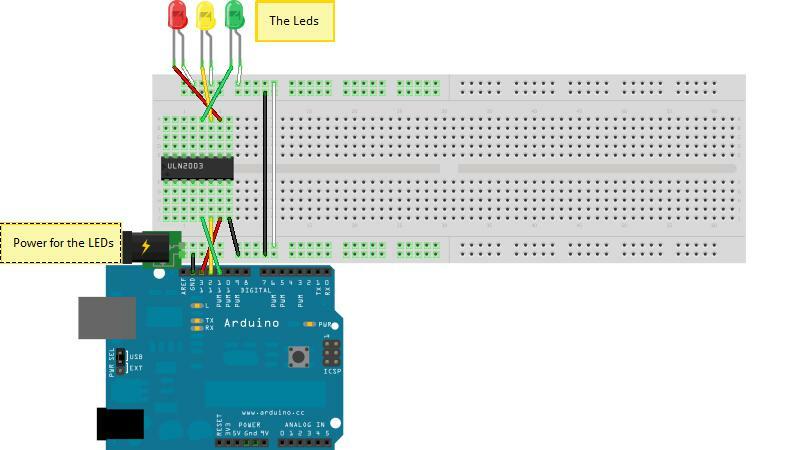 An Arduino is a programmable microcontroller that can be controlled with a computer. I have managed to get it to flash three single LEDs to the beat of music. For the software, I am using the popular “Processing” language. Basically, the software analyzed the output of the internal mic, detects the beats and signals individual LEDs connected to the Arduino. For the real controller, I am using a simple ULN2003 to drive the LEDs. I chose this chip mostly because it was what I had on hand but also because it is very easy to use and requires no external components. Below is the circuit diagram. For the lights, I am using 12 volt LED tail lights that I got at Princess Auto for $2.99 each. I got one red light and two orange lights, thinking that it would be easy to put a green lighting gel in front of one of the orange lights to make it green. In the end, this idea did not work so, I had to make my own. I simply soldered 9 green LEDs together and added a 100 ohm resistor to regulate the current. This worked great and was what I used in the final light. I fabricated the light using sheet metal in the auto body shop in my school. I started by downloading a 3d model of a traffic light and scaling it to about 1:2 using the popular Google Sketchup. I traced the measurements onto a Bristol board template. Unfortunately, I no longer have these templates and files as I did this sometime last year. I traced the Bristol board template onto sheets of steel. I bent the pieces using a brake and spot welded them together. Next, I spot welded each of the three lights together and MIG welded some caps onto the openings that I did not want to be seen. I primed it in the school’s spray booth, then waited 15 minutes while the spray booth baked the primer at 150 degrees Fahrenheit. Once the primer was dry, I gave it about 3 coats of yellow Tremclad paint. This gave it a great finish. I left it to dry overnight and was then ready to install the electronics. Once my paint had dried, I needed to figure out a way to make the lights have color when they were off but light up from the LEDs. I had originally thought about using theatrical lighting gels but they were too dark and ate up too much of my light. So I decided to have a light pattern printed in red, green and yellow at Staples on overhead transparencies. It looked great and only cost $6. Next, I had to mount the LEDs inside the light. To do this, I attached them to a long, skinny piece of wood and hung it from the removable top. The wood is attached to the top using a screw and some glue. I made a wooden bracket to hold the electronics inside the light and cut holes for the ports in the top. With all of the electronics assembled, all that was left to do was to put it all together and test it. When I tested it for the first time I found that the green light leaked into all of the other colors, which reduced the effect. This was easily fixed by making a cardboard divider. In the end, it all worked fine. I am very impressed at how well it turned out.